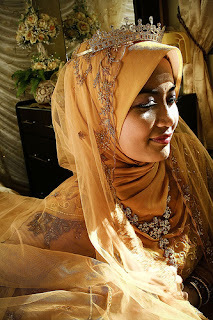 A Yahoo image search for wedding hijab will bring up hundreds more Malay style pictures from flickr.com. Stunning! hi! I love your website.. i really enjoyed looking and reading them.. I am actually from malaysia.. and am malay myself.. our style of wearing hijab is also a bit different than yours.. but which ever it is.. all is beautiful.. love it! Hi! Just a tip. If you want to search for malay hijab styles, type "tudung". It's what we call hijab in Malaysia. haha.. thanks for loving malaysian's style..